You can check out the new trailer in a tweet below (it doesn’t appear to be on YouTube at time of writing). You’ll notice that the screen divides at 0:47 and 0:51, and that at the latter moment, it looks as though two different players are controlling different parts of a new mech – perhaps one is a pilot and another the gunner. We reached out to 2K to see if they can confirm this, asking specifically about PC support, and got the statement above. That suggests Borderlands 3 will be the same as Borderlands 1, 2, and the pre-sequel, which offered split-screen natively on console, while PC players were able to mod it in. 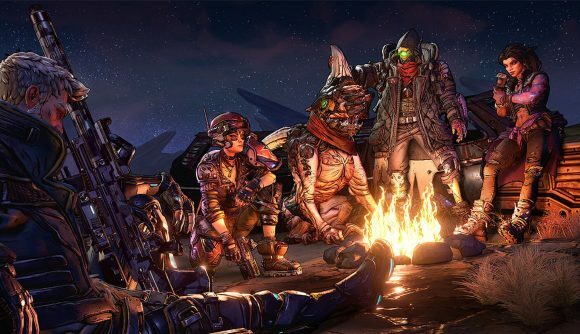 On that point, Borderlands 3’s six-month exclusivity period on the Epic Games Store is a definite issue. Though it’s on the roadmap, Epic’s store doesn’t currently offer an equivalent of the Steam Workshop, which provides an easy way for modders to package and upload their work. Hopefully Epic sorts it out, or else Steam modders do when Epic’s exclusivity elapses in April 2020. Pre-orders for Borderlands 3 have gone live on the Epic Games Store, if you’re already sold. The base game will set you back $59.99 (£49.99), and inevitably, there are more expensive deluxe and super deluxe editions if you’re feeling flush and desirous of various digital trinkets. For $99.99 (£84.99), the super deluxe includes these trinkets, plus the season pass.